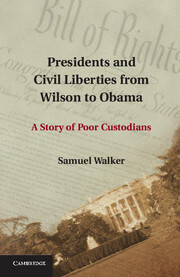 Samuel Walker is the author of Presidents and Civil Liberties from Wilson to Obama (2013). Walker is Professor Emeritus of Criminal Justice at the University of Nebraska at Omaha. He is author of thirteen books on civil liberties, criminal justice and policing. He is a frequent commentator on criminal justice and police issues in the national news media and has appeared on CNN, NBC, NPR, PBS Frontline and The History Channel. He has served as a consultant to the U.S. Justice Department and local community groups on police problems.